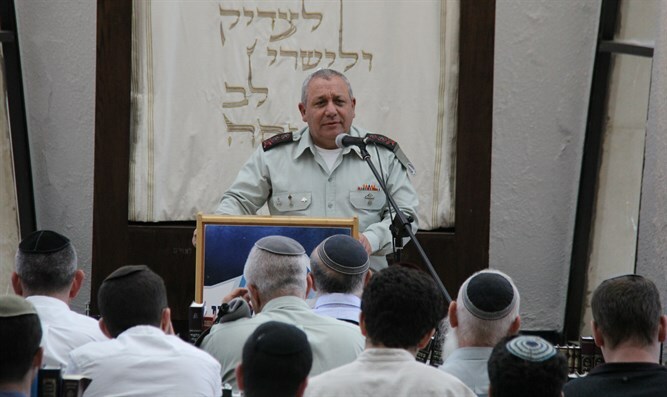 Lt.-Gen. Eizenkot visits Har Etzion Yeshiva, says spirit of IDF is rooted in Jewish tradition. The IDF Chief of Staff, Lt.-Gen. Gadi Eizenkot, visited the Har Etzion Yeshiva Friday, accompanied by members of the IDF top brass – including the Chief Rabbi, Brig.-Gen. Eyal Krim. "I am worried that only two-thirds of every 100 young people who are supposed to enlist to the IDF, do so," he told yeshiva students. "My message to young people in the State of Israel is to carry out as meaningful a service as possible – and being a combat soldier is the more meaningful kind of service." The officers met with yeshiva heads Rabbi Yaakov Madan, Rabbi Baruch Gigi and Rabbi Moshe Lichtenstein. Eizenkot also met ten men who are currently cadets at the "Bahad 1" Officer School, and who study at the yeshiva. There were controversies in the past regarding issues of modesty at Bahad 1, but the cadets told Eizenkot that they are currently able to serve in Officer School while maintaining their beliefs and values. Eizenkot also met with students at the academy for women at Migdal Oz – half of whom are going to enlist into the IDF. He also spoke with about 50 female soldiers who are alumni of the academy.